Think every stroller looks the same? These days there’s a stroller to accommodate just about every family’s individual needs! From teeny tiny folding strollers you can fit in the overhead bin when traveling to strollers that will haul your kids plus another 100+ pounds of gear, we’ve got them all here. 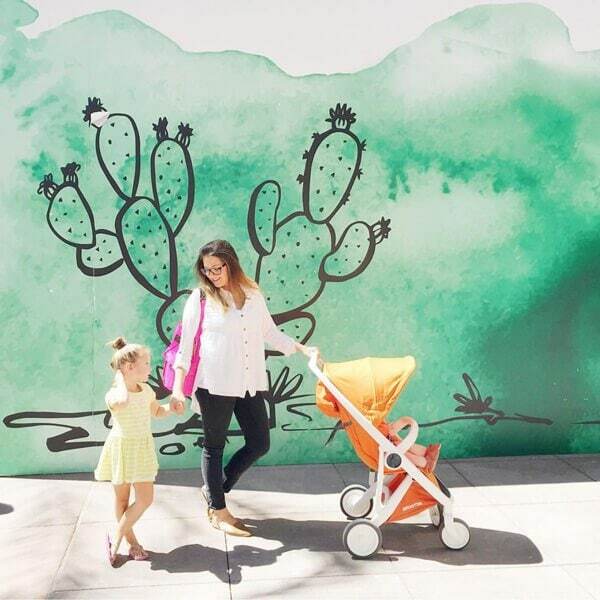 Here’s our eight favorite one-of-a-kind strollers that we know you’re gonna love! Why buy both a car seat and a stroller when you can buy just one? 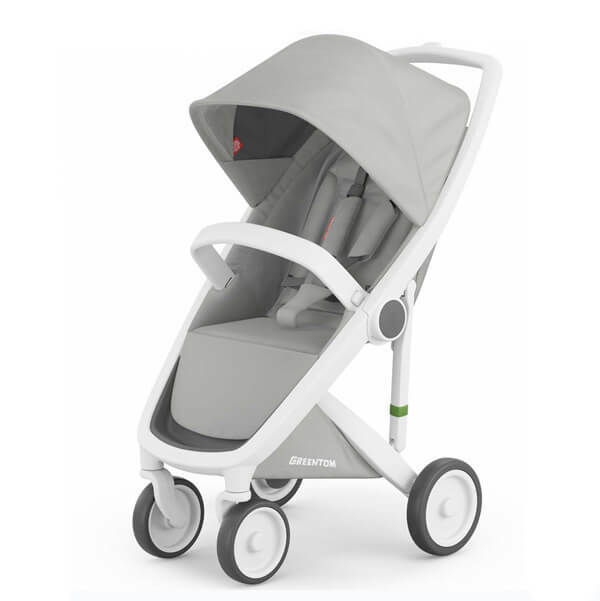 The first of its kind, meet the all-in-one car seat and stroller, Doona. With just the flick of a button, it converts from an infant car seat to a stroller – just extend the handle and off you go! The car seat is certified for air travel and as a stroller is narrow enough to push down the aisle of the airplane, making it a must-have for jet-setting families. It comes with a car seat base, has a weight limit of 35 lbs, and is available in nine color options. Things to consider, the stroller doesn’t have built-in storage like a traditional stroller, but you can purchase an Essentials Bag or an All-Day Bag separately. BUY IT HERE. Up next is another fantastic option for frequent fliers, the GB Pockit stroller. This stroller’s claim to fame is that it’s the world’s smallest folded stroller (we’re not kidding, it’s even Guinness World Records certified!). It fits into any plane or train overhead compartment, so no more checking your oversized stroller at the gate and hoping it makes it back to you unharmed. In true umbrella stroller fashion, the seat doesn’t recline so it can’t be used with babies younger than six months, and the canopy is very small. But it weighs in at just 9.5 lbs, which you just can’t beat! BUY IT HERE. Dear eco-friendly families, say hello the greenest stroller on the market, the Greentom stroller! The frame of the Greentom stroller is made completely of recycled plastic and the fabric is made from 74 (!!!) recycled drinking bottles. Greentom even states that when you are done with your stroller you can return it to them and they will recycle and reuse the components. Other things to consider: the stroller doesn’t have much room in the shopping basket and the handle isn’t adjustable, which may be an issue if you are above average height. Greentom: Loving Mother Earth, one stroller at a time. BUY IT HERE. Is that a wagon? Is it a stroller? Hold on to your hats ladies and gentlemen, it’s both. 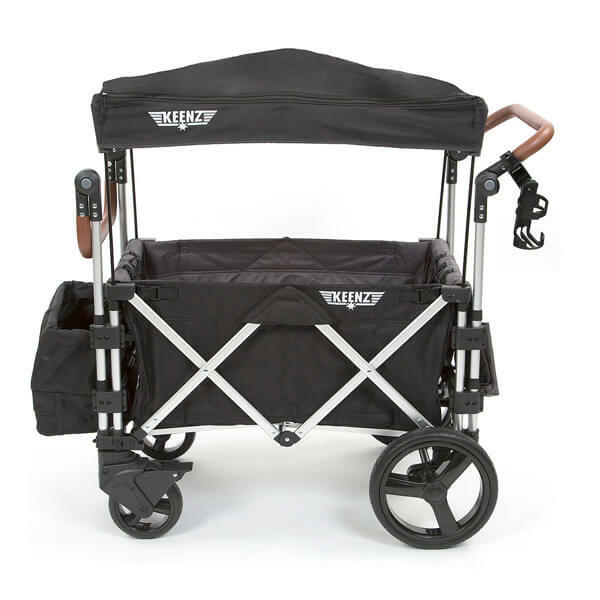 Wagon strollers are taking the market by storm and we can see why! The Keenz Stroller Wagon combines the best aspects of a stroller with those of a wagon. Similar to a stroller, it can be pushed and has two 5-point safety harnesses, but similar to a wagon, it has a deep body that boasts a whopping 110-pound hauling capacity. The Keenz is officially certified as a stroller, making it the perfect choice for trips to Disneyland (you can’t bring wagons into Disney Parks, but you can bring the Keenz because you can push it!). Another thing to love about Keenz is that it comes with a detachable storage bin, a full canopy with mesh sunscreen and fold-down curtain, and storage bag. Beach wheels, rain cover, and wind cover available for purchase separately. BUY IT HERE. When this stroller first showed up at 2015 trade shows, it blew our mind. The Austlen Entourage is a truly one-of-a-kind stroller, boasting 30 possible configurations (you heard us – THIRTY!). It is a stylish combination of utilitarian luggage cart plus convertible stroller. 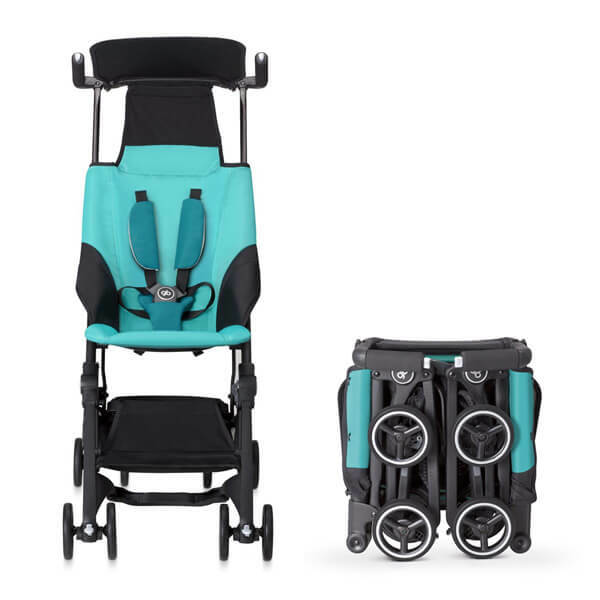 It can be used as a travel system (with purchase of infant car seat adapters), single stroller, or double stroller (with purchase of second seat, jump seat, or platform rider). 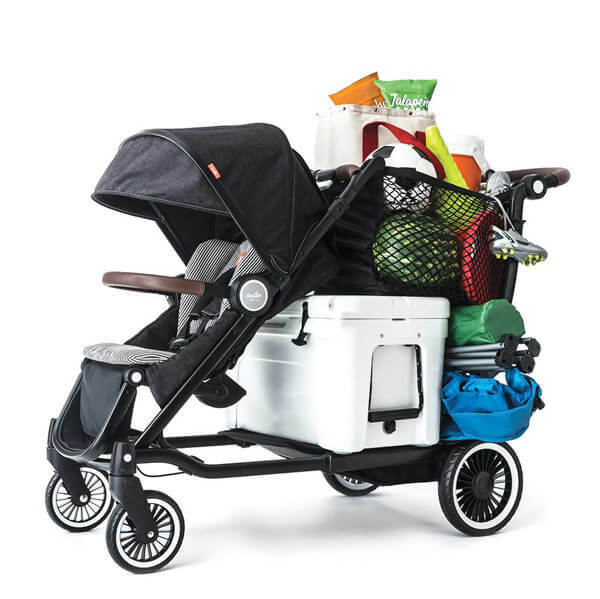 It is the highest weight-rated stroller on the market with a total weight capacity of 150 pounds, so it’s perfect if your family needs to schlepp heaps of kids’ sporting gear, groceries, or beach gear. BUY IT HERE. 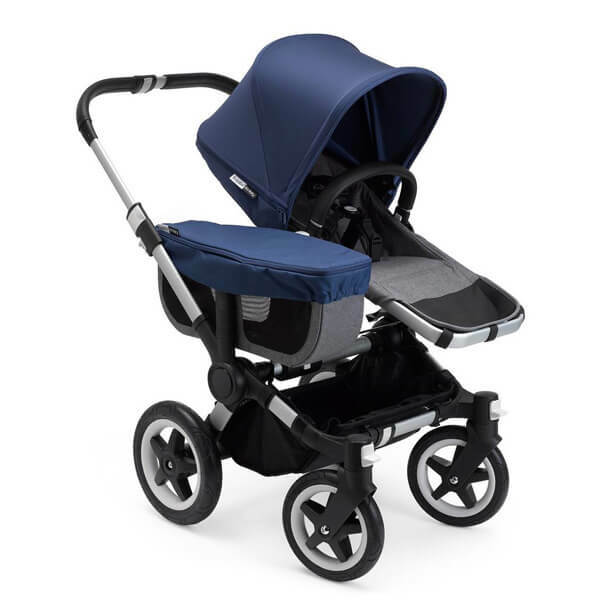 If neutrals bore you, have we got the stroller for you! Hailing from the UK, the Cosatto Supa is a lightweight umbrella stroller that comes in a variety of super cool prints (…like unicorns, monsters, and dragons, oh my!). 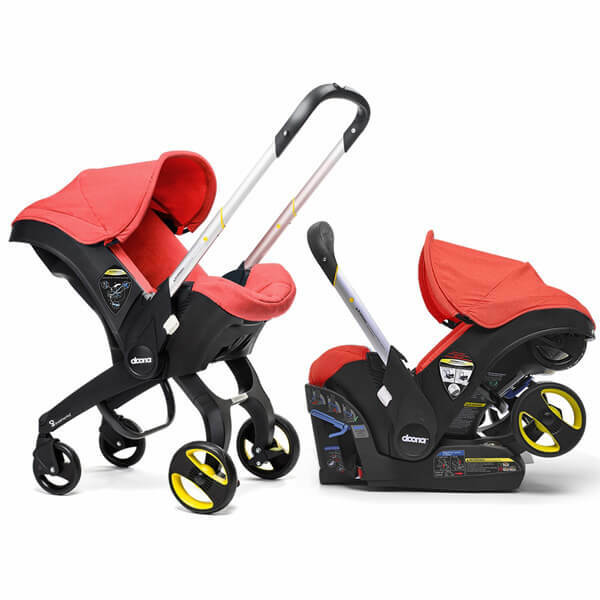 This stroller is also unique because it features an expandable UPF 50+ sunshade that has a media display pocket and built-in speaker to keep your little one entertained while you’re on-the-go. This stroller is a total stand out. BUY IT HERE. Adventure is calling! An aerodynamic stroller that converts to a bicycle trailer, the Thule Chariot is perfect for active families with a passion for the outdoors. 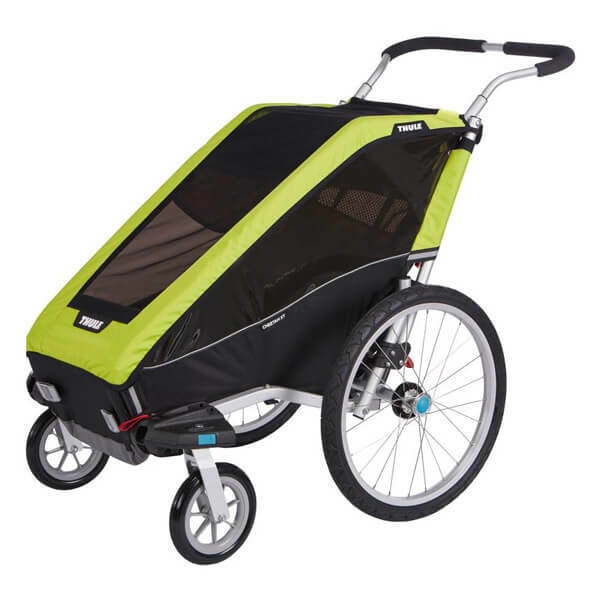 It quickly converts from a regular stroller (four wheels) to a bicycle trailer (two wheels). With a maximum capacity of up to 75 lbs, your kids sit comfortably shoulder-to-shoulder as you pedal towards your next fun adventure. And if you’re feeling extra outdoorsy, they sell a cross-country ski conversion kit so come rain, snow, or shine, your family is ready to get outside. BUY IT HERE. If you know the brand Bugaboo, you know we are talking about premium strollers. The Donkey2 Mono stroller is no exception. It features the first-of-its-kind side luggage basket that carries up to 22 pounds worth of groceries / gear / you name it, with built-in pockets and a stylish cover. And if your family continues to grow, it is the only stroller that can be expanded from a single stroller into a side-by-side double stroller. With over 17 different configurations you can be ready for anything. BUY IT HERE.